Active—not passive—learning. That’s what Swarthmore students can expect today. 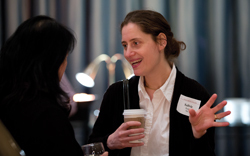 Graduates from the 1950s to the late 2000s heard examples of today’s inventive pedagogy from four faculty members Jan. 31 at a Future Directions of the College event in Philadelphia. About 50 Philadelphia-area alumni listened raptly as Rachel Buurma ’99, assistant professor of English literature; Philip Jefferson, Centennial Professor of Economics; Grace Ledbetter, associate professor of classics; and Amy Vollmer, professor of biology, talked about the dynamic experience students enjoy in their classrooms, often driven by the application of cutting-edge technology. For instance, Buurma’s Victorian Novel students carried out research by helping to create an online edition of Charles Dickens’ weekly magazine All the Year Round, which serialized Dickens’ novel Great Expectations in the 1860s. The Dickens Journals Online project is based at the University of Buckingham in England. Jefferson explained how accepting the invitation from Vollmer to “spend time in her lab and learn about science over the summer” led him to abandon lecture formats on Fridays and set up hands-on, real-world protocols with concrete objectives. He found his economics students’ retention of information improved, and they benefited by receiving instant feedback from him. President Rebecca Chopp met with faculty and alumni to for a Future Directions of the College event in Philadelphia earlier this year. Ledbetter talked about the shifts in her field—classics—in the 21st century, including an expansion from the traditionally purely historical approach. “We now take the ancient text and explore how it’s relevant in a modern context,” she said. Vollmer described how she “flips” her biology classroom. Instead of spending class time standing in the front of the room lecturing, she posts her lectures online. Students then spend their class time working on problems in small groups as Vollmer walks amongst them. “I really get to know my students,” she said. President Rebecca Chopp, who opened the evening with a short talk about upcoming events at the College, summed up the professors’ presentations: “These are not only great teachers but teachers who love their teaching.” She then fielded a wide range of questions from the audience. 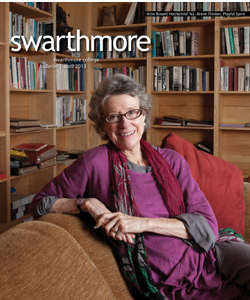 Jefferson and Vollmer referenced the College’s new Institute for the Liberal Arts, explaining that the institute is addressing some of the challenges facing small, residential colleges like Swarthmore. Chopp and Buurma, who serves with Jefferson on the institute’s committee, discussed how important it is to use interdisciplinary approaches to foster curricular, pedagogical, and scholarly innovation.